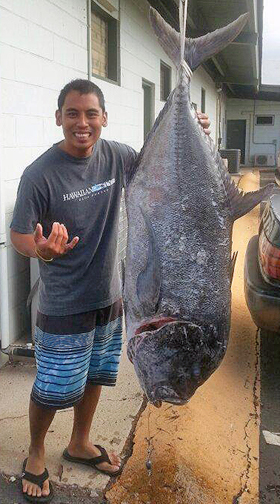 Bryan Amodo started his day with a successful dive for tako and then joined a friend's brother, Artie Ferriah, in Kaupo for a night of ulua fishing. The partners were preparing for their second slides at midnight when Bryan's 13-foot Outcast took a powerful strike. Bryan battled the huge ulua using a Newell 454 reel and 50-lb test line until Artie gaffed the monster. They hauled the fish up and the celebration began!